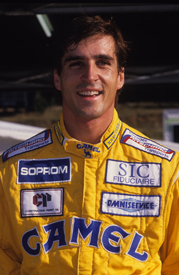 Philippe Favre, who has died at the age of 51 in a skiing accident, was a race winner in British Formula 3 before graduating to Formula 3000 and going on to become a factory Honda sportscar driver. The Swiss started racing in French Formula Ford 1600 in 1984 after a short karting career and shifted over to Britain to continue in FF1600 the following season. A second year in Britain in 1986 yielded the runner-up spot in both the RAC FF1600 championship and the prestigious end-of-season Formula Ford Festival at Brands Hatch with the Manadient Van Diemen team. Two years in the British F3 Championship in 1987-88, which included a victory with the works Reynard R+D team at Donington Park in his debut season, were the springboard to F3000. Favre claimed pole position and second place on his maiden event in the final stepping stone to Formula 1 at Silverstone in 1989, but he was never able to recapture that form over the remainder of a truncated season with the GA Motorsport Lola squad. He continued in F3000 with part-seasons in Japan with Team Noji and Leyton House in 1990 and then briefly raced in Indy Lights in the US, before being picked up by the Kremer Racing Honda sportscar team. Favre made two starts in the Le Mans 24 Hours in its NSX GT cars in 1994-95 before racing a factory-run Venturi 600LM in the BPR Global Endurance GT Series. 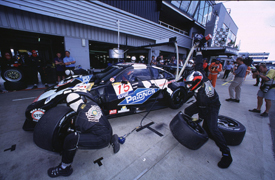 Favre made a return to front-line sportscar racing with Lister in the FIA GT Championship in 2000 (pictured), claiming podiums at the Hungaroring and Brno. He also raced a Lucchini in the FIA Sportscar Championship and the Le Mans Endurance Series in 2003-05 together with Christophe Ricard. Ricard was among the drivers Favre worked with through the track day events company he established in 2002. More recently he tutored GT driver Henri Moser.